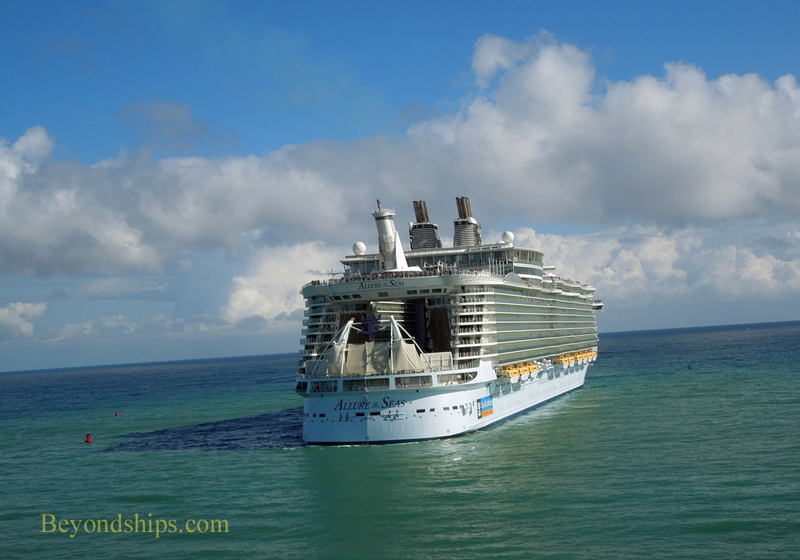 Every other week, Allure of the Seas does a cruise to the Western Caribbean. One of the ports of call on these cruises is Falmouth, Jamaica. In this pictorial, we see Allure sailing into Falmouth. At first glance, this appears to be a simple maneuver as the mouth of the bay is quite wide. However, if you look at the bouys and the white water, which indicates shoals, near the cruise pier, it is clear that this entrance is not as easy as it may first seem. 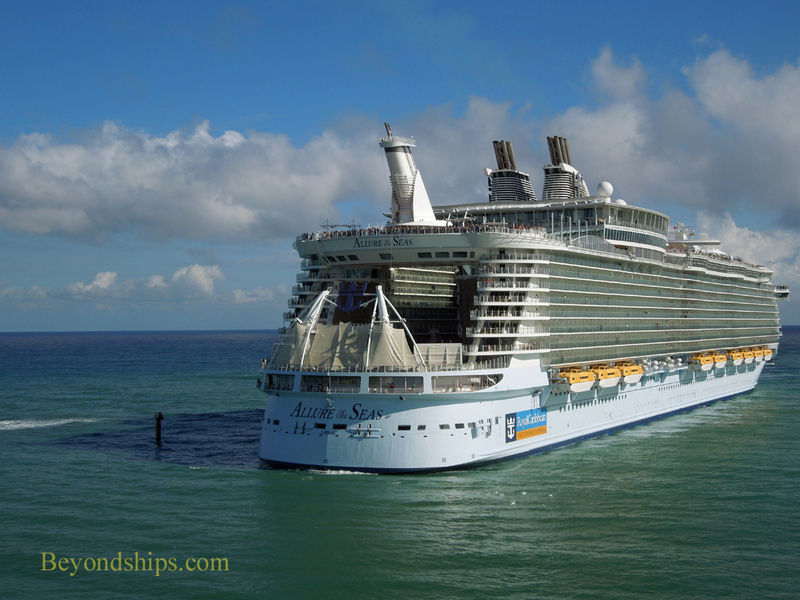 In addition, we present some some images of the ship berthed at the cruise port at sunset. Allure does not approach the island directly. Rather, she follows a course that takes her parallel to the island's coastline. Indeed, Allure continued on this parallel course until she was just past the entrance to Falmouth harbor. 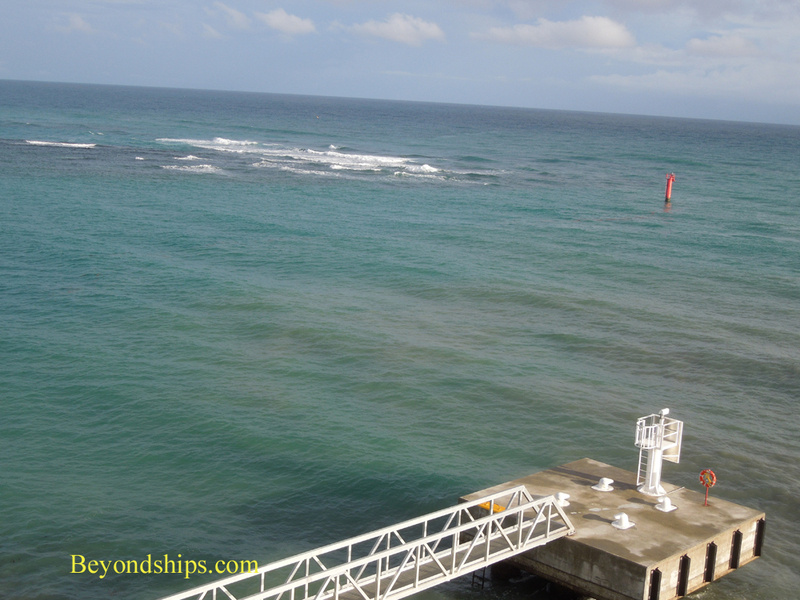 Backing into a port or into a berth is not unusual in the Caribbean. Many ports are not large enough to allow a modern cruise ship to swing around so that it can both enter and exit bow first. Captains often prefer to back into such a port, rather than out of such a port, if the weather conditions are good when the ship arrives at the port. Arrivals usually occur during the daylight hours whereas departures often take place in the evening when the visibility is not as good. Also, if the weather conditions are good when you arrive, it is best to take advantage of them then as conditions could deteriorate during the course of the day. Then rather than turn into the harbor, Allure swung around 90 degrees so that her stern was aimed at the harbor entrance. She was going to back into the port and then into her berth along side the single finger pier that makes up Falmouth's cruise port. What made this maneuver somewhat challenging was the combination of the fact that the entrance to Falmouth is relatively narrow with shoal water on each side and the fact that Allure is a rather wide ship. In addition, Allure's towering sides can act as a sail, catching the wind and pushing the ship sideways. 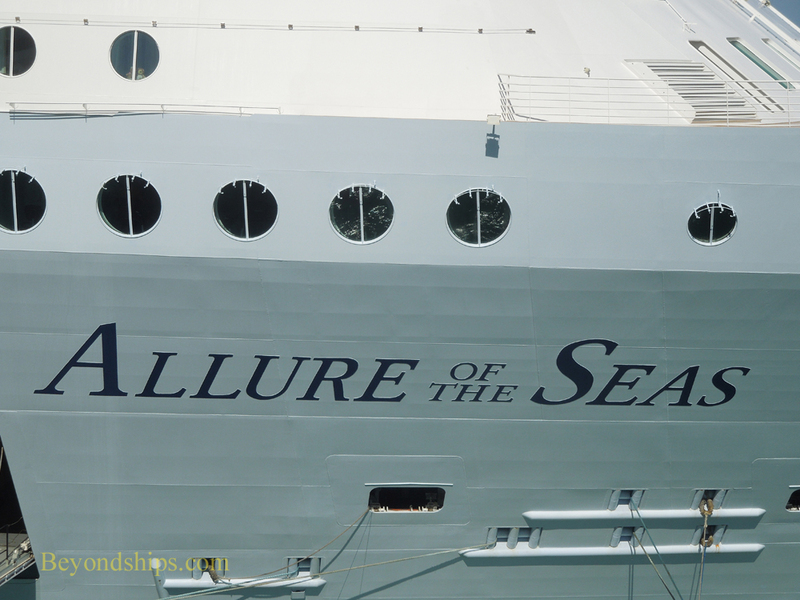 Nonetheless, Allure made it through the harbor entrance without incident and docked at her berth. Note that in the photo, there is white water on both sides of Allure. Thus, this outcome is a tribute to the skill of her captain and the power and maneuverability of her propulsion system. In the evening, Allure is lit by the last rays of the setting sun as well as by her own floodlights. Before casting off her lines, she waits for the ship that was berthed across the pier from her to clear the approach to the harbor.